As of 2014, the Maid of the Mist boat ride no longer operates from Niagara Falls, Canada. It is now only available on the American side of Niagara. The Maid of the Mist is retiring over 150 years of Canadian tradition. In its place is the ever-exciting Niagara Cruise. Hornblower Niagara Cruises are the new best thing in Niagara Falls, Ontario, Canada. 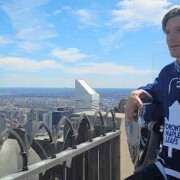 Those who wish to ride the historic Maid of the Mist still can. It is available on the New York side of the border for $17. Note: you must cross the border into the United States which may require a visa. This option is not available to everybody. 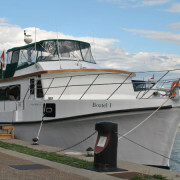 Hornblower Niagara Cruises are the only boat tour operator in Niagara Falls, Canada. Hornblower offers two brand new 700-passenger boats. They include seating, bathrooms, enclosed viewing areas, and an outdoor deck. The patio allows guests to view the Falls in their entirety. Several tour options are available. 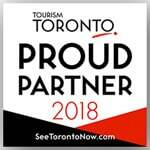 They are: Voyage to the Falls, Sunset Cocktail Cruise and Falls Illumination/Fireworks Cruise. The Voyage to the Falls Niagara Cruise is available during your Niagara Falls tour from Toronto. You can buy your ticket right on the spot when we take you to Niagara Falls. The iconic Voyage To The Falls is a half-hour boat tour. Guests travel across the Great Gorge, American Falls, Bridal Veil Falls and the Horseshoe Falls. The boats depart every 15 minutes. The incredible Voyage To The Falls tour is an amazing experience. You can purchase tickets to the Hornblower Boat Ride on the spot during Niagara Falls tours from Toronto experience. Your tour guide will drop you off right at the ticket box. Don’t worry about lines, we go early to skip rush hour. This romantic cruise offers a 1-hour cruise experience. This tour offers an extended 30-minute boat cruise that includes: music, a fully licensed bar, and snacks. View the evening sunset, starry skies and the city skyline on the Sunset Cocktail tour. Taste Niagara wines, specialty bar beverages and tasty snacks while viewing Niagara Falls like never before. This magnificent 1-hour tour experience allows you to view the Falls Illumination and Falls Fireworks. View the incredible city lights, colored illumination and the breathtaking fireworks. This is an extended 30-minute tour that includes music, a bar, snacks and entertainment. This tour is not available on your Niagara Falls day tour from Toronto. The Hornblower Niagara cruise uses two 700-passenger, brand new boats. On-board amenities include the tiered decks. These allow for a 360 degree view of Niagara Falls. There are also retractable glass walls for dry viewing. Boats have on-board wash rooms. A fully licensed bar is available at night time. The boats use 350-horsepower engines. Will I Get Wet on the Niagara Cruise? You do not have to get wet. You can stay in the indoor viewing section of the boats. For the full experience you will get wet. 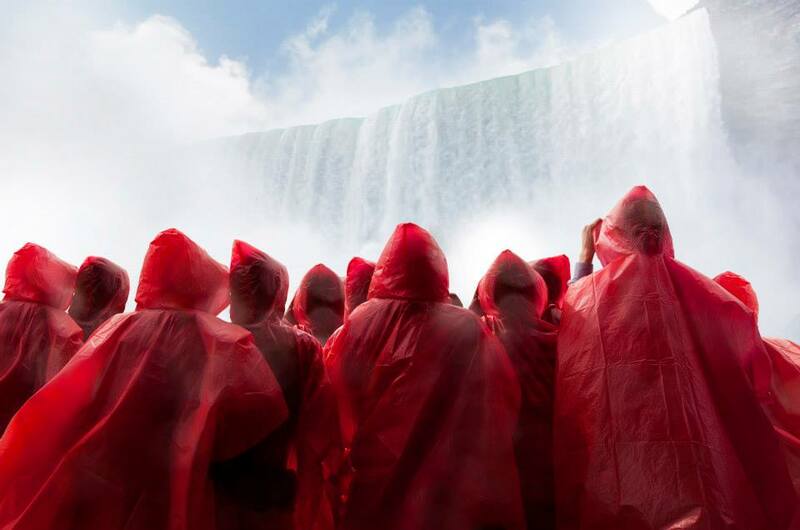 Guests receive a Canadian red poncho and will be able to stand on the deck of the boat. 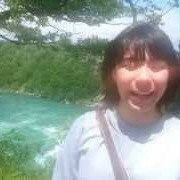 This is the best option for Niagara Falls sightseeing and just having a great time. Indoor seating is available. Before boarding the boat tour you can visit the Mist Gear shop. Here you can pick up snacks, souvenirs and items to make your boat tour experience as convenient and comfortable as possible. Picking up a souvenir will be a great way to remember your Hornblower Niagara Cruises adventure. Hornblower is a San Francisco based company that opened business in 1974. They offer yachts, cruises and ferry services. They currently operate in many major Canadian cities including: New York City, San Diego and Sacramento, just to name a few. 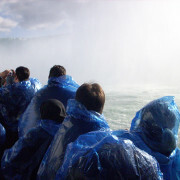 In 2012 Hornblower Canada Co. (a Canadian subsidiary of Hornblower) won the 30 year rights to operate Niagara Falls boat tours in place of the Maid of the Mist boat ride. Hornblower’s most notable cruises include: the Statue Cruises, which offers a cruise to Liberty Island and Ellis Island (for the State of Liberty), and the California Alcatraz boat tours. Hornblower Niagara Cruises are set to operate in Niagara Falls for at least 30 years. Photo Credits: Photos available VIA Hornblower. Visit Hornblower here. Like their Facebook page for more photos here.